The first noted Haslett is of the province of Ulster in Ireland in 1778. Descendants immigrated to Canada, Hawaii, Australia and New Zealand. Although many of the Canadian descendants stayed in Ontario they are also found in other parts of Canada and some in the United States. This book at over 400 pages includes Haslett and related families along with a name index, place index and general index. It is available on microfilm from FamilySearch.org and is also downloadable as a digital file. This book at over 440 pages includes Haslett and related families along with a name index, place index and general index. In 1778 William Hazlet occupied a farm in the Whitehill townland of parish Taughboyne, county Donegal, Ireland. The farm was leased from the eighth earl of Abercorn. Later the family occupied farms in Tyrone and Londonderry counties. Several members of the family emigrated to North America, and Australasia. This book is an attempt to record the history of that family in Ireland and to compile information on their subsequent movements. Hundreds of William's descendants lived in several countries and some have not been identified. Descendants used several forms of the Hazlet name but the majority used either Haslett or Hazlett. Meaningful biographical material could not be collected for many of William's descendants because of time and data limitations. Emphasis was placed on people in the first five generations and considerable data were assembled on a few people whose life experiences ensured their entry into public records. These people tended to be associated with legal, surveying, and military activities. The fortunes of one small part of the family were traced in some detail over 150 years by examining the lives of: a farmer from the second generation who carried a landlord-tenant legal dispute in Ireland (perhaps the longest such dispute in Ireland) to the bitter end; a surveyor grandson from the third generation who seized an opportunity to participate in a substantial way in the economic development of the central part of Ontario; one of his great-grandsons in the fourth generation who attained a prominent position in Ontario’s legal fraternity; and another great-grandson who pursued a colourful career as a soldier and Canadian Mounted Policeman. Information was not as readily available on other parts of the family, but an attempt was made to describe seminal events in the lives of a few additional people even when it was not possible to provide a complete account of their lives. In several cases events described were in the military sphere, partly because of the drama and horror inherent in conflict between nations, and partly because some activities of military people were entered in public records. Linking the Haslett family to the family of Niall of the Nine Hostages. Linking the Whitehill Hasletts to several other Haslett families of Ireland. Establishing that the common ancestor of the families was Thomas Heslett who arrived in county Londonderry about 1630 and settled in the Liffock townland of Dunboe parish. The house occupied at one time by the family is known as Hezlett House and is part of the National Trust of Northern Ireland. Microfilm No. 795989 Item 19. 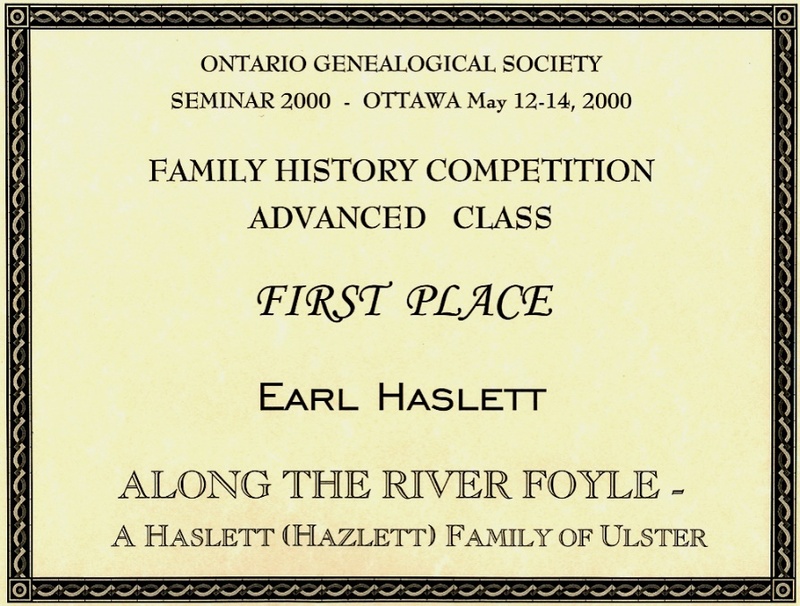 Along the River Foyle: A Haslett (Hazlett) Family of Ulster will appear. You can choose to read, print, or download the book. The OGS Family History Competition was open to members of the Society who published a family history book in the previous decade.